Vtr never met .1 home woodworker yet who had loo much space ¡11 the workshop. Maybe dial explains why they're always looking for ways to use the space that is available as efficiently as possible. One of the most useful, space-saving ideas I've come up with is this Revolving Tool Station. Basically, it's a rotating tool sland that provides easy access to a number of benchtop tools in a small amount of space. WORK CENTER. The heart of the work center is a large circular platform that spins around like a carousel. Mounting your benchtop tools to this platform provides quick access to each tool while keeping the others close at hand. 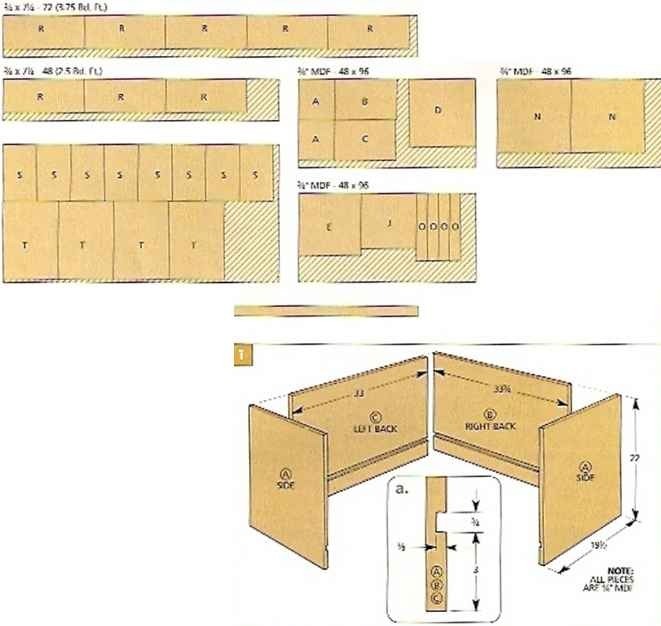 storage areas. TTie carousel also features plenty of room for storage. Directly underneath each tool isadrawer that's perfect for storing accessories. Between the drawers are open shelves. 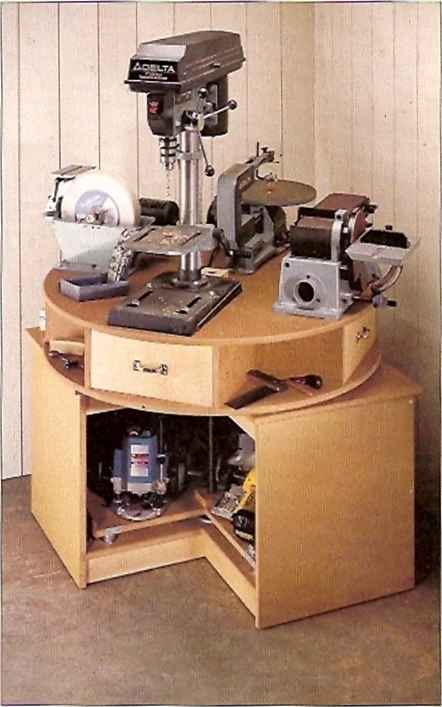 And a large rotating turntable in the base provides storage for a number of your portable power tools. materials. 1 decided to use Vr MDF (medium-density fibeiboard) for the large parts of this station, not only because it's easy to work with, hut also because its density will 1 ielp damp the vibration of the tools mounted to it. 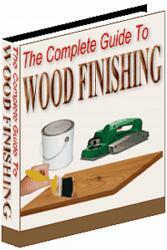 If you prefer, you could also use plywood. hardware. There isn't much special hardware needed for this project. You will ueed an iron pipe with a flange. 2 ; couple of small pieces of aluminum angle, ^ and several l"-roller bearings. These bearings let the turntable and carousel spin smoothly. For mail-order sources of hardware, see page 112. NOTE: MCf SHFFTS ARC TOI DRAWN TO THF SAML SO»LÎ AS OTWft CIU.LS. 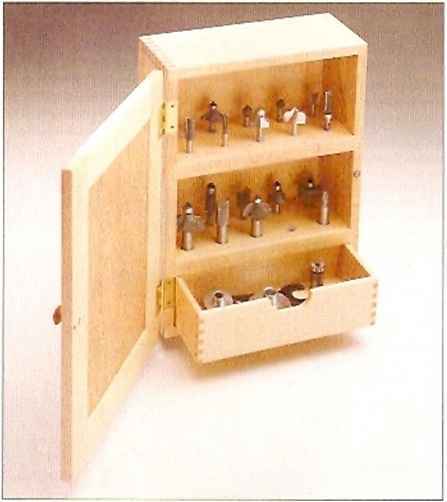 I began work on the Revolving Tool Station by making an open, I, shaped base cabinet (Fit). ! )• The shape of the base will provide easy access lo the turntable that's added later. And it will allow plenty of leg room when working at the tools on the carousel — while still tilting conveniently into a corner of your workshop. SIDES AND BACKS. The base cabinet starts out as two sides (A) and a right (R) and left back <Q piece (Fig. I). Note: For these pieces, I used Vi" MDF (medium density liberbnaid).bul plywood would work just as well. These four pieces are held together with simple bult joints. So lo allow for the joinery in the back corner, the right back is a little wider (&&/C) than rhe left back C«"). TOP AND BOTTOM. 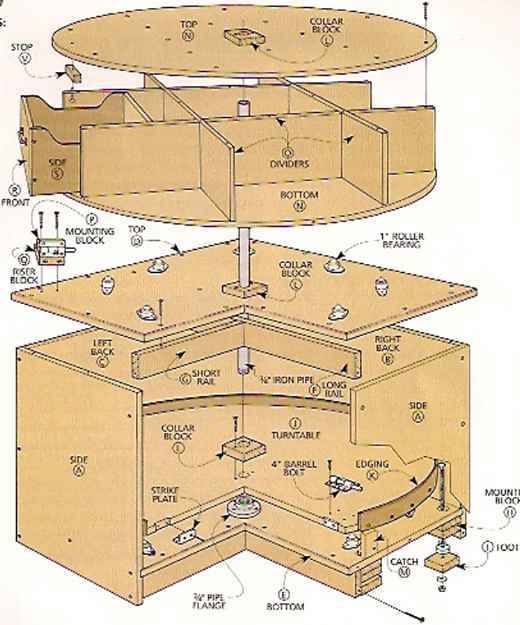 Besides holding the case together, the top and bottom provide a surface for mounting a number of roller bearings (see the photo on the opposite page).The roller bearings on the bottom make it easy to spui the turntable around, while those on the top allow you to rotate the carousel smoothly. the top and bottom edges of the top and the lop edge of the bottom (Fig. 2). ATTACH ROLLERS. Now youVe ready lo attw.ii llie rollers lo the lop and bottom After spacing the rollers evenly around the perimeter of a large circle, they're Äcrewed in place (Fig. i). * Note: To provide plenty of support near the edge of the carousel, the circle on top has a linger radius (16") lluui the one on the bottom (W). Before assembling the base, it's best lo drill several large holes. There's a hole in rhe top for an iron pipe that serves as a pivot poinl for the turntable and carousel (Fig. 2). Also, five holes in the bottom will be used when levelers are added later. ASSEMBLY. At litis poinl. yuu can begin putting together the base cabinet. 1 started by gluing up a U-shaped assembly consisting ol one side and the two back pieces. "Ihcn 1 slipped the bottom in place and added the other side. Note: Reinforcing each joint with screws during assembly will help strengthen the base. RAILS. To add even more rigidity, I installed two hardwood rails under die top and bottom (Fig*. :?and.±). A long rail (F) spans from one side lo the left back. .And a short mil (('.) connects the long rail w- to the opposite side. ATTACH TOP. All that's left to complete "lite base of the station is to attach the top. It's simply positioned, then glued and screwed to the rails, backs, anrl sides (Fig.i). ROLLER BEARINGS. MOUM/fig 0 Mlfiibct of roller bearings to the top and bottom of the tool station in a circular pattern will allow both rhe carousel abrvse and the turntable below to spin smoothly and easily. 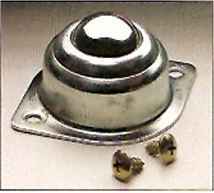 For sources ol roller bearings like rhe one shown in the photo above, seepage I ¡2. I ho s<iOp-m?.de leveling system I used for ;he Revolving Tod button can easily be adapted to other projects and fixtures. For example, if your bencn rocks on an uneven floor, you can aod a leveler to one leg to compensate. 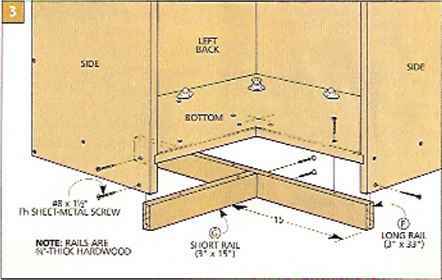 Brxikrases that st on j carpeted floor next to a wall tend to lean forward bccause of the tack bar under the carpet, if this is a problem fo: j cabinet in your house, levelers at die front of Hie case will keep the unit from tipping forward. How to make a garden tool stand? How to build a power tool turntable caddy? 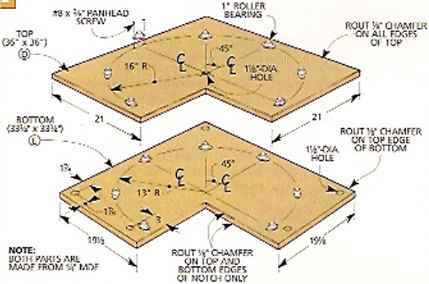 How to make a circle table top with wood? How to make a two level lazy susan? How to make a power tool carousel? How to make a large shop tool carousel? Which tool is classified as a rotating tool? How to use turntable scratch tools?